Warwick Valley High School is proud to announce its 2016 Valedictorian, Lauranne Wolfe, and Salutatorian, Bria Metzger. Valedictorian Lauranne Wolfe will be attending Vassar College in Poughkeepsie to study history and math, and she plans to go on to graduate school. Professionally, she can see herself teaching while pursuing her passion for writing fiction. An avid reader and writer, Lauranne completed her first novel in the spring of 2015 and is planning to get it published. Lauranne’s artistic gifts also include music, and she is a flute player with the Hudson Valley Honors Youth Wind Ensemble. She is also a member of the National Math Honor Society (Mu Alpha Theta), and the WVHS Writing Club, Book Club and Math Team. Throughout middle and high school, she has tutored her peers and younger children in different subjects – math, science, and history. 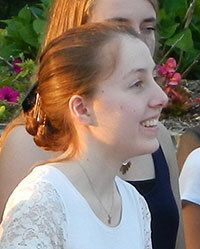 Lauranne is also a 4-H member and has volunteered with “Families with Children Adopted from China” since 2006. Perhaps her most significant contribution to the community has been her volunteer work at the Albert Wisner Public Library, helping with children and teen programs since 2009. She has been the President of the Teen Advisory Board since 2014, and the Captain of the Regional Battle of the Books team since 2011. Lauranne feels very lucky and thankful to have grown up in Warwick with great friends and inspiring teachers and mentors, and especially with a family who always believed in her and with whom she has had the greatest times. Lauranne Wolfe is the daughter of Frank and Marie-Christine Wolfe. pursue an independent concentration of her own design in either Marine Biology or Modern Conservation Methods. Bria is currently co-president of the local Mu Alpha Theta chapter, and a member of the Orange County Academic League, Warwick Crew, and Writers’ Workshop. Displaying a multitude of interests from an early age, Bria has explored poetry through participation in local poetry events, achieved an open water dive certification last summer, and recently finished a three-year Science Research program. She presented her research paper, “Variability in the thermal threshold of the model organism Aiptasia pallida” at the Annual Science Research Symposium. Every summer, Bria works at Free Spirit Nature Camp, which works to promote the role of nature in the development of children and their futures. 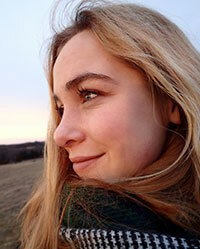 Bria Metzger is the daughter of Veronica and William Metzger. Lauranne and Bria were honored at the Outstanding Student Recognition Dinner on May 25, at the West Hills Country Club in Middletown. District and school officials and the students’ parents were in attendance. Warwick Valley High School will hold its Graduation Ceremony Saturday, June 25, at 10:00 a.m. on the Warwick Valley High School football field.